VIPAccessEXCLUSIVE: Jack And Jack Updated Interview With Alexisjoyvipaccess At Matthew Espinosa’s “Be Somebody” Movie Premiere! They may have shared action figures, or even glue when they started off their friendship way back in kindergarten, but one thing we do know that they shared is an excellent bond that years later made them one of the biggest duos out in entertainment history. Say hello to Jack and Jack – aka the singing / rapping duo that is taking over the world by storm. The stage is the second home for Jack Gilinsky and Jack Jackson as they have been performing around the world, causing a sensation and pandemonium at each one of their concerts. It’s so incredible to see how Jack and Jack’s exceptional music has joined so many people together as these two incredibly talented guys look out to their audience and see faces filled with joy, tears of happiness, and tons and tons of creative signs. Jack and Jack’s success continues to increase more and more as the milliseconds go by as they have announced a lot of other exciting projects in the works. Jack and Jack just recently revealed news about their very own book that is coming out (We’re crossing our fingers for some super cute #TBT photos of these two!) and they also have their highly-anticipated album being worked on. Despite all of their awe-inspiring accomplishments, Jack and Jack continue to remain so humble and down-to-earth, not to forget, they take some of the best meet-and-greet photos with all of their fans! We all can’t wait to see all of the other extraordinary projects that Jack and Jack have ready to bring out to their fans and there are oh, so many reasons why we all can’t get enough of the spectacular Jack and Jack! I, Alexisjoyvipaccess had an excellent time covering Matthew Espinosa’s “Be Somebody” movie premiere and had a terrific time catching up with and interviewing the magnificent Jack and Jack again at the event. Jack and Jack dished exclusively to Alexisjoyvipaccess all about the one emoji they would use to describe the feeling they get when they perform in front of all of their fans, the upcoming projects they have in store, and so much more only in our VIPAccessEXCLUSIVE updated interview. Jack and Jack even sent out one inspiring and marvelous message out to their fans – hear what they had to say in our VIPAccessEXCLUSIVE updated interview below. Also, don’t miss out on the epic interview-bombs from Matthew Espinosa and his dad! 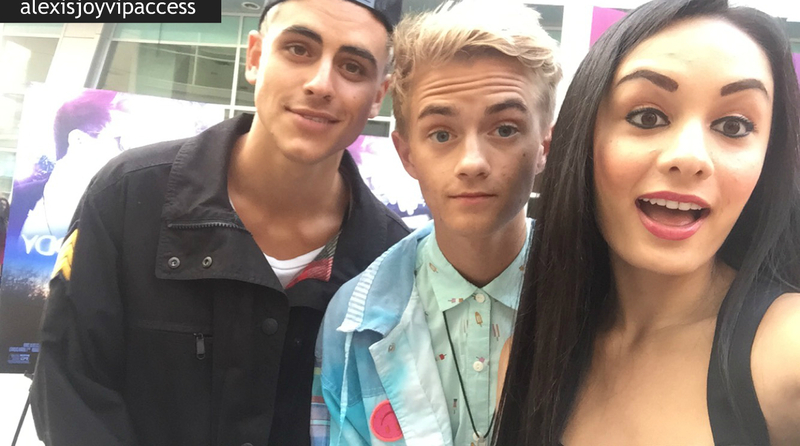 Thanks for another fun interview, Jack and Jack – always a blast chatting with you guys! Check out my VIPAccessEXCLUSIVE updated interview with the remarkable Jack and Jack at Matthew Espinosa’s “Be Somebody” movie premiere below! Previous VIPAccessEXCLUSIVE: Lele Pons Updated Interview With Alexisjoyvipaccess At Matthew Espinosa’s “Be Somebody” Movie Premiere! Next VIPAccessEXCLUSIVE: Matthew Espinosa Interview With Alexisjoyvipaccess At His “Be Somebody” Movie Premiere!